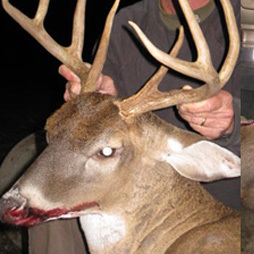 Going deer hunting is often times a gamble. There are many times when you go out to hunt deer, only to spot zero deer in the area. Other times, the area is so full of other hunters that you have to worry about your deer being scared away by others. Instead of dealing with others and not finding any deer, you can go on guided deer hunting trips at the Cedar Knoll Hunting Lodge. Our team of experts have years of experience and are ready to provide you with a world-class experience. One of the most noteworthy benefits of going out on our guided deer hunting trips is knowing exactly where the game is located. The skilled hunting guides at our location are ready and willing to take you to the spots where deer are typically found. We feature a supplemental feeding program on our land, which means that we are able to maintain a deer herd many times greater than is typically found in our area (one of the most productive in the world) all year long. Furthermore, if you do not receive suitable shooting opportunities, we will welcome you back at the non-hunter rate of $150 a day. Another great benefit to hunting with us is that you will have access to our large, private land. We are located just south of Fairfax, near the Savannah River. Deer, as well as hogs, quail, and turkey, tend to be numerous in this area and the feeding program allows us to raise infinitely more than nature would provide for otherwise. All you have to do is let us know what kind of animal you would like to hunt on your trip and a member of our team will take you there. Our knowledgeable hunting guides are prepared to take you on a trip that you will never forget. Whether you are on one of our guided deer hunting trips or hunting for wild boar, you can feel confident that you will have a successful trip to the South Carolina Lowcountry. For additional information on our inexpensive packages or to ask general questions about hunting in the area, call us at (844) 868-5348 and speak with a member of our team today. We provide a vast array of options that are sure to be perfect for your hunting trip.